mommy bytes: I've been blagged! Image from London Toy Fair has nothing to do with this blag (blag = tag + blog), but I can't post without an image!! I've been blagged by Theresa at Sleeping Kitten Dancing Dog. Each player starts with eight random facts or habits about his or her self. These blagged chosen ones are to write posts on their own blog about these eight facts. They are also to post these rules. At the end of their blog they will list eight people they have chosen to blag by listing their name and a link to their blog. Here are some random things about me. My favorite flavor of ice cream is coffee heath bar crunch. I was due on December 25th, but was born 10 days late on January 4th. I am always worried that people will discover that I'm just faking my job. I have a secret celebrity identity on Twitter as well as myself. Here are the eight people I have blagged. 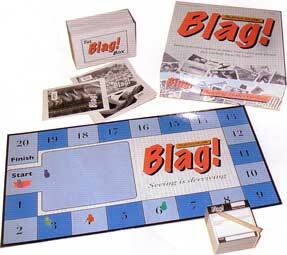 Have fun and Happy Blagging. Bridget at ..."And Miles To Go Before We Sleep..."
Thanks for the blag tag :) I will definitely do this, sounds like fun!! Have a wonderful weekend. Thanks for including me...but I've done this one a few times and have been having to turn it down since. Sorry! Okay, it's taken me a while to play catch-up with meme-tags, but mine is up! Finally, in a few hours my blagged post goes up. Thanks for including me.